As the stars of the music industry take center stage this Sunday to accept their gilded gramophones at the Grammy Awards, among the long list of “thank-you”s are likely to be a pair of Dragons who’ve had a hand in making some of the most highly regarded music of 2013. 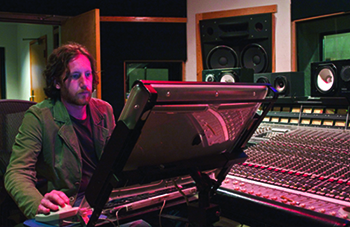 The work of Joseph Hallman, an adjunct instructor in performing arts, and Ryan Moys, a facilities manager in the music industry program played significant roles in albums that earned Grammy nominations. Hallman’s original compositions “Three Poems of Jessica Hornik” and “imagined landscapes: six Lovecraftian elsewhere” are part of the album “Sprung Rhythm” that is a nominee for the Best Surround Sound Album. “We all, each and every one of us involved in this project, wanted to bring a unique and rich experience to our listeners. Something that engaged you without gimmick or artifice. Something you could feel,” Hallman said. The Surround Sound category is a fairly new one for the Grammys – “Best Surround Sound Album” was first awarded in 2005. It is one of few categories open to both classical and non-classical recordings. The definition of surround sound quality is that the piece is recorded with a minimum of four channels. Ryan Moys, a facilities manager at Westphal College, has had a hand in making an album with gospel artist Tye Tribbett, that is nominated for three Grammy awards. Moys worked on a Grammy-award-winning album in 2009, Kirk Franklin’s “Fight of My Life” album, off which his eponymous song won “Best Gospel Song.” He continues to work with some of the industry’s top musicians at a local recording studio, while also bringing his experience to the classroom at Drexel. Visit these pages for more information about Westphal College’s Grammy-nominated faculty and alumni.